There are many things you probably want to feel when flying, relaxed, excited, ready to sleep the flight away…. But when enclosed in a steel cage flying tens of thousands of feet in the air surrounded by strangers, the last thing you want is to feel like your insides are about to rip apart (and then maybe even let one rip! How long is your flight?). What is this magical something you can do to make sure your flight is more comfortable for you and your fellow travelers? Pretty simple, actually. Watch what you eat. While they might look mighty tasty as you stroll to your gate, those chicken wings aren't going to help you fly. 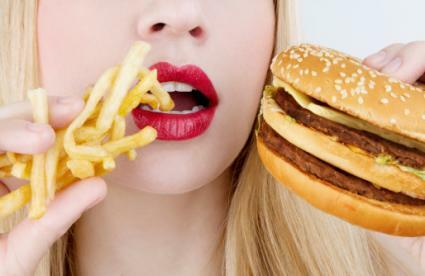 Loaded with tons 'o sodium, fried, greasy foods are sure to bring on the bloat. So skip the airport Mickey D's or that ooey, gooey slice of pizza. Opt for healthier fare such as lean proteins, unsalted nuts, and fresh fruits and veggies. Wondering why all that grease is going to make for a rough trip? It's all about the tummy. Maybe you're familiar with the feeling. As the plane begins its ascent, with each ear-popping minute, you feel more and more like the Stay Puft Marshmallow Man. Feet starting to swell, waistband getting a little too tight, and are those your fingers or little sausages? Why does this happen? Science! 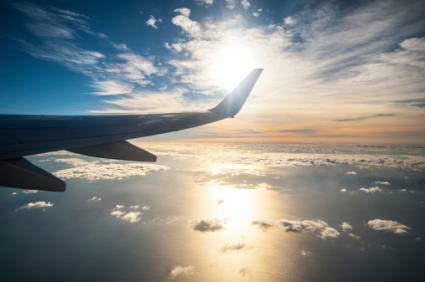 According to Conde Nast Traveller, flying high in the sky causes the pressure in the cabin to decrease which in turn makes the gasses in your tummy expand. Flight attendants even have a name for this: jet belly. Yum. And one of the main causes of jet belly? You guessed it! Greasy food. Soooo whatever can you do to not hurl your cookies once that motion sickness kicks in?!? Well, for one, probably not eat cookies. But are cookies the worst? Not really. Turns out, heavy, sodium-filled meals are common triggers for motion sickness. It might be tempting to drink your anxiety away or start your vacation early with some adult beverages at the airport bar, but alcohol is best avoided because it is dehydrating. In addition, it's another major trigger for motion sickness. This actually shouldn't be much of a surprise. If something can make flat ground feel like it's spinning, what do you think happens when your inner ear balance is already off? And if you're really lucky and turbulence hits, say sayonara to whatever you ate. The good, the bad - either way it's gonna get ugly. 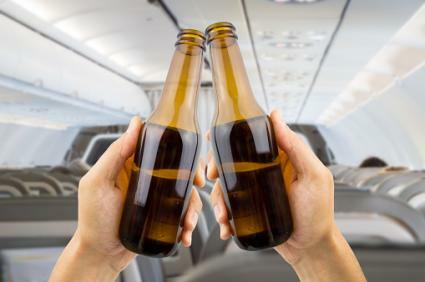 Besides causing these uncomfortable and potentially embarrassing issues, drinking alcohol before flying can cause something a little more serious: deep vein thrombosis (DVT). According to the Mayo Clinic, DVT is a blood clot that can form in the veins in your body, often the legs. DVT can happen if you have a medical condition that affects how blood clots in your veins, but it's also possible from long periods of inactivity, like sitting in a cramped airplane seat for hours at a time. 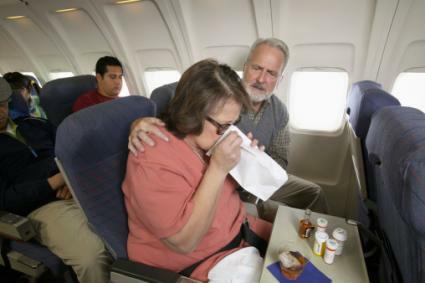 What's more drinking too much alcohol before and during your flight can cause you to become dehydrated, adding to the risk of DVT. Try to stick to one alcoholic drink and drink some water to help stave off dehydration. You're not mowing down on a burger or swilling martinis at the airport bar, so you should be off the hook, right? Not so fast. Watch out for these baddies too. Sodas, sparkling water, seltzer. Why? Bubbles. Gas. 'Nuff said. You know you have one. Basically, anything that causes you to blow up like Violet Beauregarde in "Willy Wonka and the Chocolate Factory" is not something you want to eat before getting on a plane. For instance, some people eat onions like it's going out of style. But for others, one bite of onion and their breath isn't the only bad smell they have to worry about. Funny, isn't it? 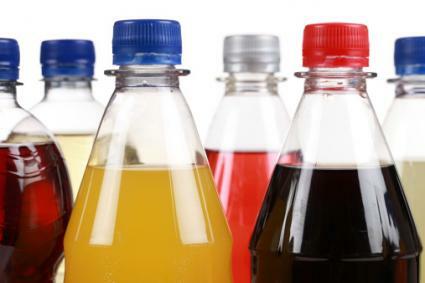 A lot of what's mentioned here are things we're often advised to avoid in our everyday lives. Hmm, I wonder if there's something to that? Preventing every possible hiccup, burp, or other bodily emissions is impossible. Things happen that are beyond our control like a flight delay leaving you with very few culinary options in a foreign airport. But for the most part, following the advice above should prevent most issues most of the time.